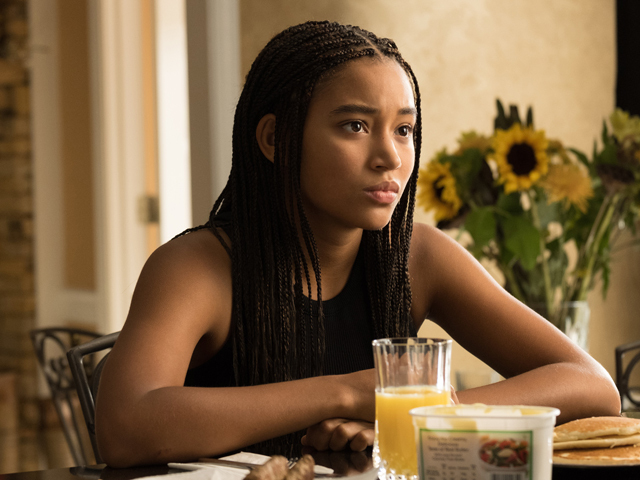 Synopsis: Sixteen-year old Starr Carter (Amandla Stenberg) lives in Garden Heights, a working-class community with her close-knit family. Her father, Maverick (Russell Hornsby), is a reformed ex-gang member who grew up in Garden Heights and once served time in prison. Now, a family man and valued member of the community, Maverick owns the community grocery store. Starr's mother, Lisa (Regina Hall), a nurse, was also reared in Garden Heights, in a family that aspired more for its children through education, just as she does for her own. Half-brother Seven (Lamar Johnson) and younger brother Sekani (TJ Wright) complete the family. Dismayed by the academic achievements of schools in their community, and wanting to give their children better opportunities, Lisa and Maverick enroll Starr and her siblings in Williamson Prep School, a predominantly white school about forty minutes away. In Garden Heights, Starr is Starr Version One. She is comfortable speaking the slang vernacular of her community, enjoys hip hop without feeling self-conscious, but fears being seen as acting "white." At Williamson, Starr becomes Starr Version Two. There, she is constantly on guard not to appear or act too 'hood.' She refrains from speaking slang, even if the white kids do, her two best friends Hailey (Sabrina Carpenter) and Maya (Megan Lawless) are not black, and her boyfriend, Chris (K.J. Apa) is white. 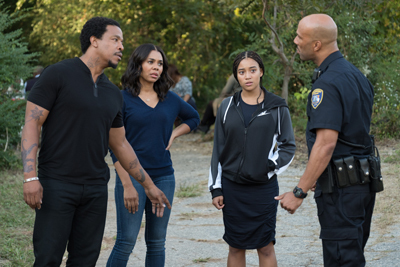 Everything changes when Starr witnesses the shooting death of her childhood best friend, Khalil (Algee Smith) at the hands of a police officer during a traffic stop. As the sole witness, Starr must choose between speaking up for Khalil, or remaining silent. Telling the truth could also endanger herself and her family by implicating King (Anthony Mackie), Garden Heights' drug lord who Khalil worked for. And, she worries about the Williamson community connecting her to Khalil's death, and what they will think. As her community cries out for justice for Khalil, and word spreads about Starr's involvement, Starr finds herself navigating an increasingly volatile environment. Starr begins a journey of self-discovery, one that will reveal powerful truths and realizations about herself and, where her true community lies. In the early months of 2016, publishing houses found themselves in a bidding war for the unpublished manuscript of first-time author, Angie Thomas. Entitled The Hate U Give, the story focused on Starr Carter, sole witness to the death of her childhood friend at the hands of a police officer. The coming of age story featuring an African American teenager who lives in the workingclass community of Garden Heights, but who travels 45 minutes to attend a private prep school in the prosperous community of Williamson, also sparked interest in the offices of Hollywood production companies on the lookout for new material. George Tillman Jr. was one of the fortunate early beneficiaries of the manuscript. The producer and director, well known for his family and community centered portrayals of African American life in such films as Soul Food and the Barbershop franchise, knew he was on to something. Tillman had an immediate connection to the story. "I read the first chapter and was pulled in right away. I felt that the themes around the African American family dynamic, self-identity and being black were particularly strong and not something explored a lot in film. This is especially true when it explores the idea of 'Am I black enough?' I thought it was an opportunity to explore a fresh take on these issues from a young person's perspective. I wanted to be one to bring this story to life, and felt that my entire career was leading to this point where I can make this movie authentically." It was Tillman's skill dealing with ensemble casts that made Thomas imagine doing the same. "Soul Food was one of the things that pushed me into writing. He has an ensemble cast in that movie and it made me think maybe I can write a lot of characters too," offers Thomas. The other inspiration for the book was closer to home, and all too real. The shooting death of Oscar Grant in Oakland, California on January 1, 2009 at the hands of a BART police officer made headlines all across the country. Although Grant's death took place hundreds of miles away, it triggered conversations in Thomas' dominantly black neighborhood and her majority white private prep school. "In my neighborhood Oscar was one of us," recalls the Mississippi-native. "At my school, maybe he deserved it because he was an ex-con." Her anger and frustration resulted in the decision that would change her life. "I decided to write a story about a boy named Khalil and a girl named Starr, who have to deal with a situation much like Oscar's." Thomas' short story became "The Hate U Give," and connects the fictional world of the movie to the long line of high profile police shootings of young black people that have sparked protests and gained national attention across the US in recent years. Tillman and his State Street producing partner Robert Teitel weren't the only ones who wanted to option the story. Producers Wyck Godfrey and Marty Bowen from Temple Hill were also chasing the work. Tillman snagged the first call with Thomas, and clinched the deal with his questions. He asked, "Is it about this individual who is searching for identity, who finds her voice and finds out who she becomes, against a background of police brutality and racism? Is this what you intended?" For Thomas, it was clear that they shared a similar viewpoint. "He gets it. He gets the themes of it. He gets the feelings of it, he gets what's not on the page," remembers Thomas. "I wanted to make a film that feels modern for a young audience, but, also for a universal audience that creates a dialogue about important issues about race, social justice, and identity in order to move towards peace and change," explains Tillman. Godfrey and Bowen's enviable record of successfully translating books like the Twilight series for the screen was not overlooked. "Temple Hill and State Street were both so dedicated to the project and excited about the book and the possibility of making a movie," explains Thomas. "Their vision was phenomenal. It wasn't too long after I got my publishing deal that we decided to let them option it." State Street and Temple Hill approached Fox 2000 to set up the project and were given a green light. Actor Amandla Stenberg had also gotten hold of the manuscript. A voracious reader, Stenberg was caught by "the way that this black girl is characterized, there's so much heart and depth and nuance." She started her campaign to be involved immediately after finishing the book. "I called my agent and said "we gotta do this," and he called Fox." The studio recognized the potential immediately and soon it became a package deal with Stenberg as Starr, Tillman as director, State Street Pictures and Temple Hill producing, and Audrey Wells to write the screenplay. Thomas was ecstatic at the news of Stenberg being attached to the project. "It felt right because I was thinking of Amandla as I created Starr. Her activism and the way she uses her art form and her platform to speak up, and speak out for the oppressed was a definite inspiration. We couldn't have had anyone better as Starr." Adapting a book for the screen is a creative challenge. The filmmakers chose to conflate some characters and change some plotting details but keep its essential truth. "We wanted to make sure to keep the fundamentals the same," notes Bowen. "But, it was critically important to understand Starr's journey from a young girl who witnessed a horrible tragedy to a young woman willing to stand up for the things she believes in." The filmmakers opted to actively involve Thomas in the project. "I don't think we could have had a more collaborative process with an author as we did with Angie," says Teitel. The connection between Tillman and Thomas that began during the initial call over the story deepened through the development phase. "We became friends because I just started calling her and asking her every little thing possible," Tillman recalls. "She would say, "Okay, this is how I'm feeling…"
The story was very much connected to a reality that she knew, and as a director I wanted to capture what made the book special." Tillman got the talk from various relatives growing up in Milwaukee, and understands the power of showing the ritual on screen. "I felt that for the first time we really caught that on film," he says. "You're seeing a black father have the conversation to make sure that his kids are safe." It wasn't until Bowen read the book that he learnt about the talk. "As a white male of some privilege, I never got 'the talk,'" says Bowen. "That is what is going to be good about this movie: to allow people to understand that some people's circumstance and environments are not the same as yours." Adds Teitel: "My wife is black, and my kids are black, and I am going to have to have the same talk one day. Anything can happen when your child leaves the house. It's your responsibility as a parent to have that talk." Rehearsing the opening scene was a particularly emotional and painful experience for Russell Hornsby. "I started saying those words and broke down and cried," he recalls. "I have two young boys at home and it hit me in that moment what I will have to do one day. It took on a different meaning for me. It's not just Maverick talking to Starr, it's Russell as Maverick talking to other young black girls and black boys of America. Audiences are going to bear witness to a father saying to his children 'you better heed what I'm telling you because it can save your life.'" Code switching can be defined as the practice of changing one's behavior to suit different environments. For the African American community, code switching is yet another survival tactic that often takes an emotional toll. Starr struggles to reconcile her life in Garden Heights with her life in Williamson. This aspect of Starr's story is taken directly from Thomas' life. "I went to a mostly upper-class private college in Jackson, Mississippi while living in the hood. I would leave my house playing Tupac. By the time I got to school, I was playing The Jonas Brothers. I thought that was what I had to do to fit in. Over time, I realized I could like both." It didn't take long for Tillman to notice and appreciate the similarities between Thomas, Stenberg and Starr. Stenberg has also gone to a private prep school while living in a black neighborhood. "I grew up in a lower income black community and had the same experience of realising that I had to code-switch to fit into my school environment." "Knowing that she had dealt with the same issues only served to confirm how perfect she was to play Starr," notes Tillman. Tillman sympathizes with the impulse to fit in. As a black director in Hollywood, he has done it himself. "Early in my career, my wife and I went to a big, exclusive Hollywood house party and there were only three other black people. I remember my wife asking me "Why are you so afraid to just be yourself?" That's the central question for Starr in the film." 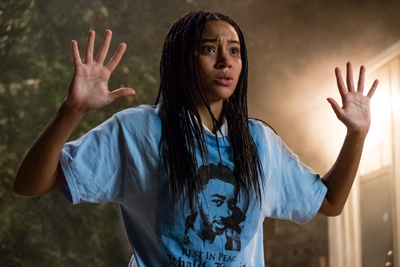 The Hate U Give is about Starr's awakening, triggered by Khalil's tragic death. Tillman explains, "Tragedy forces Starr to realize who she is meant to be," explains Tillman. "This is what the story becomes, it's about her journey of being a full person." Being the sole witness to Khalil's death, Starr is thrust into a situation that seems insurmountable. "It challenges her whole life, it challenges her whole perspective, it challenges her identity, as she has to figure out if she has the strength to speak up for him and what she believes in," explains Stenberg. "It takes time for her to reach a place of strength where she feels comfortable to use her voice. But it's because she thinks deeply about her actions, and her priorities are her family, her friends and her community." It is also there that she finds her strength and resolve. The early lessons from Mav had given her a solid foundation from which to start her journey of self-discovery. "He taught her to recite the Black Panther Ten Points Program, and about Malcolm X and Huey Newton and Martin Luther King, and so Starr has an understanding of who she is within the historical context of America," explains Stenberg. Lawyer and community activist, April Ofrah also plays a pivotal role in the final phase of Starr's growth. Played by Issa Rae, April rallies the Garden Heights community to demand justice for Khalil. "April was fun to play because she was so outspoken and persistent," says Rae. "She wants justice and is willing to go to the Carter home and ask them to put Starr on television, and persuade her to testify for the grand jury. The bravery that requires on both ends is admirable." Initially suspicious of April's motives, Starr grows to appreciate what is being offered. "April recognises how important Starr's voice is, and pushes Starr to utilize it as best she can," says Stenberg. "It's not until Starr realizes that she does need to use her voice that April and Starr develop a camaraderie, and April gives Starr the tools she needs in order to speak." The protest scene is the culmination of the journey Starr takes in finding her voice. "It is the moment where Starr stands up for what she believes in, and stands in the authenticity of where she comes from," recalls Stenberg. It is also the sequence where Thomas makes a brief appearance. Stenberg adds. "I came up with this idea that Starr would put on one of the 'Rest in Peace Khalil' shirts, to really honor his life in that moment. And George had the idea of having Angie be the one who gives me the t-shirt, so you can see her, right before I get on top of the car. It was the perfect touch." "The Carter family faces a lot of challenges, but, what remains through all of that is the deepest sense of love, of friendship, of strength found in each other," says Stenberg. "It's so important that we get to see that on screen." Russell Hornsby echoes that statement. "George is bringing a depth, a feeling, a passion back to family and more specifically, back to the black family. Audiences get a glimpse into what loving black families look like." Hornsby was Tillman's choice for Maverick, who overcame his life as a drug dealer, gang member and convict to become a loving family man and a positive presence in the community. Tillman has long admired Hornsby's body of work. Hornsby's immediate connection with Stenberg during the audition was the final confirmation. "We just knew he was the one. Once the studio saw Russell's audition, it was a done deal. He was our Maverick," says Teitel. "I was drawn to Mav's gravitas, his sense of purpose and his manhood in the script," says Hornsby. "Once I got on board and read the book, this became even more of a passion project for me. Angie's commitment to detail, to authenticity helped bring the characters to life. I know these people, I know this world, I know this family, I understand their struggles, and, so that was something I wanted to give voice to." "Russell was a great leader for the actors and for the team that we had," adds Tillman. "He did an amazing job. Like Amandla, he put a lot of heart and soul into the project, in terms of time spent developing the character." Mav prepares his children for the world by teaching them about their worth, and their rights. He is both protective and supportive. Stenberg speaks to their father-daughter relationship. "He's very loving and sweet to her, but he is also stern because he realizes she has the potential for greatness, and he expects nothing less." Their on-screen bond reflects the connection they enjoyed between takes. "Russell and I had a similar dynamic to Starr and Mav," notes Stenberg. "He had great expectations for me, but was always willing to lend his support and his strength. There was so much mutual respect, and the way in which he was there for me was invaluable." Hornsby is effusive in his admiration of his on-screen daughter. "Amandla is a revelation. She is a truth teller, immensely talented, exceedingly bright and very present. We can have real conversations about life, about the world, and about the work. It was been a pleasure to work with young people who know their way around a set, who understand story and character but still have a willingness to learn." Regina Hall was the first person Tillman thought of for the role of Starr's mother, Lisa. "Regina is well known for her comedic timing, but, she is equally adept at dramatic roles. She is very versatile and one of the best working actresses today." Hall proved an easy 'get' after reading the script. "The subject matter was so powerful and timely. The issue is as relevant today as it was 40, 50, 60 years ago." For Hall, Lisa is someone who showed early promise before it was derailed by an unplanned pregnancy. Now, she is a devoted parent who "wants to create a better future for her children. She doesn't want Starr to make the same mistakes she did, or for her sons to get involved in the lifestyle Maverick had." Lisa wants her children to break the cycle that often sabotages the futures of children from communities like Garden Heights. And so, she and Maverick make the financial sacrifice to send them to Williamson. "It's about trying to put them in the environment where they have the best opportunity to go to college, and so they have a fighting chance in the world with other kids who have access to more information and better schooling," adds Hall. Lamar Johnson plays Seven, Mav's son from a previous relationship who is closer to Lisa than his mother Iesha. Like Starr, Seven is also split between two worlds; the loving family of the Carter household, and the chaotic home Iesha shares with King, the local drug lord. Seven benefits from living with Maverick and Lisa; he becomes the first to break the cycle by graduating Williamson and eligible for college, by the end of the film. For Johnson, the Carter parents are a positive model of black parenting. "Mav and Lisa instill such morals into their children," says Johnson. "It's awesome to see Mav's past and see where he comes from, where he is now and, the type of father that he is." The film's title and Thomas' book references Tupac Shakur's concept of THUG LIFE, an acronym for: The Hate Give Little Infants Fucks Everybody. "That's what Tupac believed," says Bowen. "We reap what we sow. The damages we do to one another gets passed on from generation to generation. If we don't stop hurting one another, future generations are going to have the same problems. This movie is a metaphor for that." Newcomer TJ Wright as Sekani embodies this idea in the film. Tillman expands. "Sekani's the infant Tupac is talking about. He sees the police take down his dad. He's seeing gang-members shoot to scare Starr from going to the grand jury. The sequence with Sekani and the gun gets to the heart of the issue." The filmmakers approached Common for the role of Carlos, Starr's uncle. "Common brought his calming, caring energy to the role," says Tillman. "I'm a black police officer, which within this story becomes a real challenge – as it must be for some real-life black police officers who work in the community." says Common. He offers Starr a police's perspective on Khalil's death and asks her to trust the system. However, Carlos is forced to admit some hard truths himself about his own bias. Tillman explains. "Carlos believes that he's taught a certain amount of things about how the police conduct themselves but also he admits himself in one particular scene in the movie, that he sees race in the wrong way as well." "Through Carlos' character that film explores what happens when we have internalized racism, and how we police ourselves and contribute to bias," adds Stenberg. "George did really well with the family," says Teitel. "He got them together early doing family outings because they needed to be a family on screen. Amandla, Russell and Regina were cast early, so they had time to talk and build the character base, which was fantastic." "It was important to me that the cast develop chemistry and relationships that would resonate on film. We had two weeks of rehearsals and more than that, just an opportunity to get to know one another as people outside of our roles," explains Tillman. "That's what I think really comes across in this film. You get the sense that these characters have a genuine bond and love for one another, despite their circumstances." "I have to tip my cap to George for casting such a well-rounded family. Everybody came to the project with an open heart and open arms and a willingness to give of themselves," adds Hornsby. Garden Heights' resident drug lord, King is portrayed by Anthony Mackie. "This is our third movie with Anthony, so it was just a phone call "Hey man, you have to do this movie," says Teitel. Mackie didn't need much persuading. "I would do background work for George Tillman." He was also "intrigued by the idea of this young lady finding her voice." For Mackie, Starr begins to find her voice in opposition to King's aggression. "King and his boys are telling Starr to stay quiet because snitches get stitches. But this little girl has more strength than any man or adult in the community because she stood up and spoke out." Like Starr and Khalil, King and Maverick grew up in Garden Heights. Mackie explains their history. "King and Mav were childhood buddies. They were responsible for the drug game in the neighborhood before they got pinched. Mav goes to prison. King did what he was supposed to do to make their relationship right, but after Mav got out, he becomes his own man and King stays in the game. That's where the tension comes in." Algee Smith plays Khalil. In crafting the character Tillman "was inspired by the incidents surrounding the death of Philando Castile in Minnesota and several others who tragically died due to encounters with police." Khalil is not in the movie for long and, within that time, you have to fall in love with him and feel Starr falling in love," explains Stenberg. "You also have to realise that while he has a lot of responsibility taking care of his mom and his grandma, that he is still a kid. Algee makes you realise all of that." Khalil is central to the story because not only does he trigger Starr's emotional and political growth, his death also causes "her friends to realize that they may not be speaking up for injustice as much as they could be," adds Algee. His tragic death allows Starr to discover her true allies. K.J. Apa plays Starr's boyfriend, Chris. Apa was brought in to replace the actor originally cast who made insensitive remarks on video. "We needed to re-establish chemistry, and further, work hard to make it even better," recalls Tillman. Stenberg was initially very wary "Then I spent time with K.J and was blown away," says Stenberg. "We laughed a lot, which I really needed during that period, and we became great friends. I felt such a sense of camaraderie with him and realized that he really cared about this story and understood what it meant." Tillman describes Chris as someone who has "never really looked at race because he comes from an upper-class, very rich family. He goes to private school in Williamson. He's dating a young African American woman, but he doesn't know what it's like for her to grow up with the racism, and living in the inner city." Despite the difference in their backgrounds, Chris is willing to try and bridge the gap. "Chris ends up getting to know Starr when she opens up her world to her," says Apa. "At the start he didn't really understand racism. He understood it in an intellectual way, but Starr opened his eyes." "I love that Starr can be authentically herself with Chris," says Stenberg. "I love that they don't have any judgment towards each other, that they are into the same stuff. I love that Chris authentically and truly loves this girl and is willing to do anything to make her feel supported." Music is a very important aspect of the film. The spirt of Tupac hovers over the story through the title and in the soundtrack. A big fan of Tupac's music, Thomas explains. "I used to want to be a rapper but realized you can only say so much in 16 bars. But hip hop is poetry. It's raw and unfiltered and very reflective of black culture. Starr's going through something so traumatic but we're not holding back. We show the ups and the downs. That's what hip hop does. They go hand in hand." There's the music of Williamson and the music of Garden Heights. Tillman explains. "When Starr's at Williamson, she's Starr Version Two, so her style, her behavior, and the way she does things is going to completely change the music. In Garden Heights she hears a different kind of music and loves the contrasting styles there." And then there's the music of the score composed by Dustin O'Halloran. "These three different styles of music connect to where Starr is at, physically and mentally, at any particular time," concludes Tillman. The Hate U Give was shot in Atlanta. Notes Tillman, "Atlanta is a very popular place to shoot because it has many different looks and we were able to find a match for Jackson, Mississippi as Angie had in mind for the book. It had the feeling we were looking for, and the city was very open to having us there." Stenberg agrees. "Atlanta is probably one of my favorite places ever. There were several other projects shooting at the same time, so it felt like this black cultural mecca. It was amazing to be there and to revel in that energy." The film's emotionally taxing scenes led the cast to find creative ways on and off set to keep it light. "It helped that most everyone was away from home on this set. Algee grew up in Atlanta so this was sort of his town," says Tillman. "Because of the family dynamic, it was easy for people to relax and enjoy one another off-set. Regina Hall was responsible for bringing a lot of light to this project. Many people may not know, but she has a great sense of humor, along with of course Anthony Mackie, too." "Between takes, we were always singing Beyoncé, one day we were working on the Jonas Brothers, which was funny because in the book, our characters are obsessed with the Jonas Brothers. We wanted to maintain lightness and keep it fun," recalls Sabrina Carpenter. Tasked with conceiving the look of the film, production designer William Arnold relished the prospect of creating Starr's two distinctly different worlds. "I wanted to show how they are different and then also how they come together." Arnold and Tillman use color to differentiate between the two environments. "Color helps tell the story visually. I find that aspect of my work challenging and exciting," continues Arnold. They decided to use reds and yellows for the Carter family's neighborhood, and relied on whites and blues to depict 'the colder, brighter world' of the Williamson environment. Arnold also worked closely with costume designer Frank Fleming to ensure that the color palette was consistent, especially during the protest scenes. The sequences with protestors and police were shot over four days. "There's this energy when you inside a protest or riot, or as we like to call them, an uprising," says Tillman. "How do we make it feel real?" "For me, the challenge was how to keep the emotion going, because it is really about people going in one direction and then meeting up with a resistance, and being driven back," offers Arnold. "And at that point, a visual chaos breaks out, noise and people not knowing what they're going to run into next." Tillman credits the "individuals who worked on this movie, the background; they came prepared. One of the successes of the film is that we were able to capture what it's like to be in front of a police force and protesting, really trying to stand up." 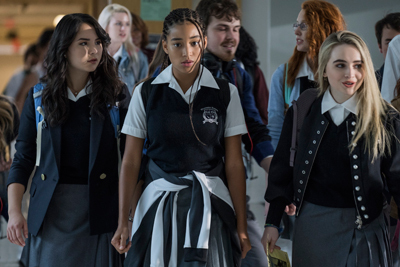 "The Hate U Give was the first film for me that felt purely instinctive. Decisions were made in collaboration with both the cast and the studio," adds Tillman. "20th Century Fox really honored our vision for this film by allowing us to make choices that allowed it to be authentic to our culture and history. I will always be grateful to have had them as partners on this journey." Of working with Tillman, Stenberg says. "I feel so proud to have witnessed George's process from beginning to end, and see how much he dedicated his mind, heart, soul, body to the project. Even when he was worn down, he was still giving me a pat on the back and giving me a hug and assuring me. That dedication translates to the screen." "I truly hope that The Hate U Give will make people think and continue the dialogue about our differences. We all have biases within us. When you have a one-dimensional, self-centered approach to life, it does not allow you to understand how your actions and words can impact others," offers Tillman. "I hope the film encourages people to have more empathy in everything we say and do. And always tell the truth. We did our best to tell the truth in this film, as difficult as it might be to face. It's important to be yourself, to stand up, to not be afraid to speak the truth and be heard." Tillman continues. "I also want the audience to know your voice can make a difference. Maybe not at that exact moment, but down the line, and that's what The Hate U Give really stands for. I want people to be able to walk away and be inspired."